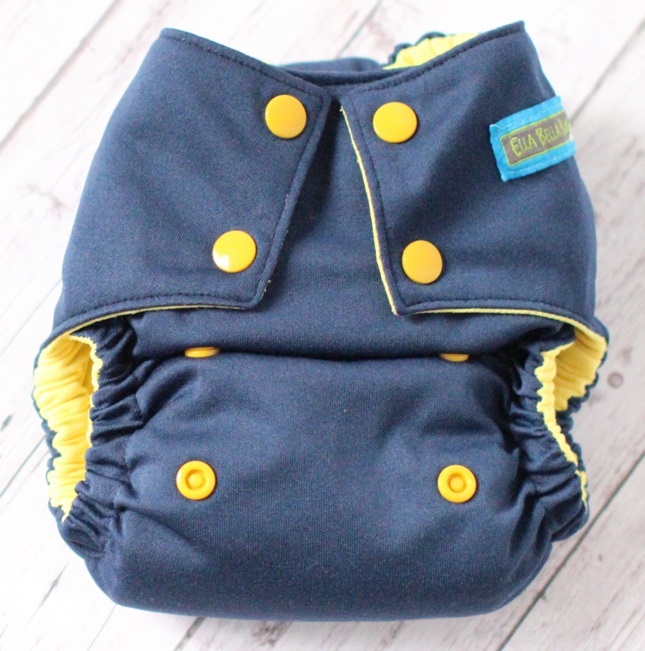 Ella Bella Bum makes one-size pocket diapers with striking color options and a trim fit. I watched this brand from the sidelines for awhile, and wish I hadn't waited so long to try it. Find out why we love this pocket in our review below. 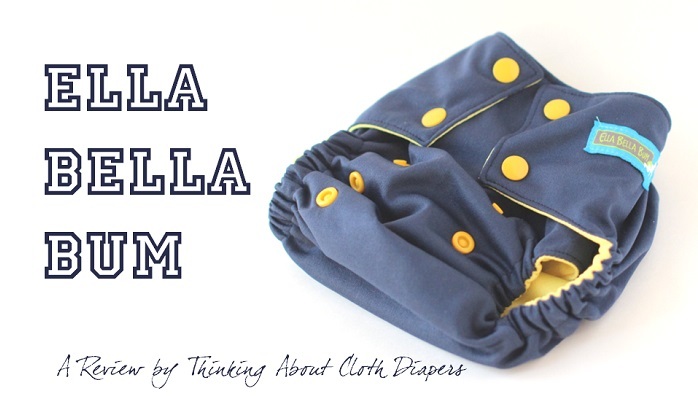 Ella Bella Bum is one of those cloth diaper brands I've been watching for awhile. When they launched in 2010, they brought a fresh new style and set of features to the cloth diaper market. With their edgy prints, custom embroidery, ruffle bums, each diaper was it's own work of art, which made them incredibly popular - and incredibly hard to purchase! Every stocking sold out within seconds! 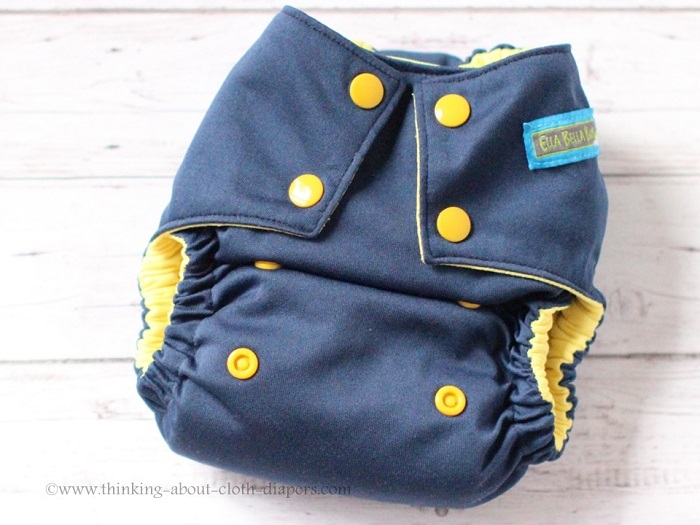 When my second son was born, I knew there were a few cloth diaper brands I "needed" to try, and Ella Bella Bum was definitely near the top of my list. When my son started outgrowing his newborn stash, I started watching the Ella Bella Bum stockings more closely. Although I was too late to the stocking to snag one of the wrap around embellished diapers in one of Ella Bella Bum's new exclusive prints (recent stockings have featured designer wrap prints with themes including pirates and dragons, and characters from Star Wars and Frozen, which sell out within seconds), I decided to give Ella Bella Bum's Ella'ssential Pocket Diapers, which are kept in stock, a try. My first (but I'll say not likely to be my last!) Ella Bella Bum purchase was the "Varsity" pocket (shown above), which features a navy outer with a citron yellow inner and accents. Ella Bella Bums is a proudly Canadian company - and is actually quite local to me! All Ella Bella Bum diapers are designed by Sam Campbell, and are sewn by her and her team of work-at-home seamstresses in Welland, Ontario. Inside view shows back open pocket and Ella Bella Bums signature Athletic Wicking Jersey inner. Outside view shows snap-down rise adjustment, square tabs and waterproof PUL shell. This diaper is constructed with an outer layer of PUL waterproof material. While most pocket diapers feature either microfleece or suedecloth as a stay-dry barrier between the absorbent insert and your baby's bottom, Ella Bella Bum diapers use a signature athletic wicking jersey material in a contrasting color. This fabric is soft, a bit stretchy, and very light-weight. I feel like it's durable, but I also love that reduces bulk in the diaper. 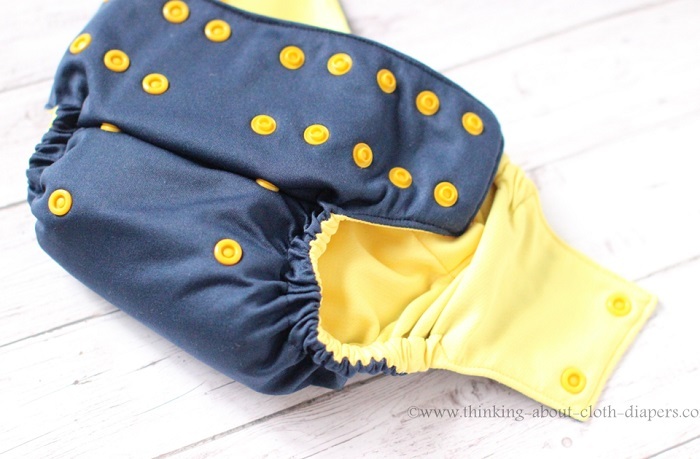 The Ella Bella Bum is one of the trimmest pocket diapers I have ever tried. Ella Bella Bum pocket diapers are sold as shells, with inserts sold separately. The Varsity diaper I purchased is $18, and inserts are $9. 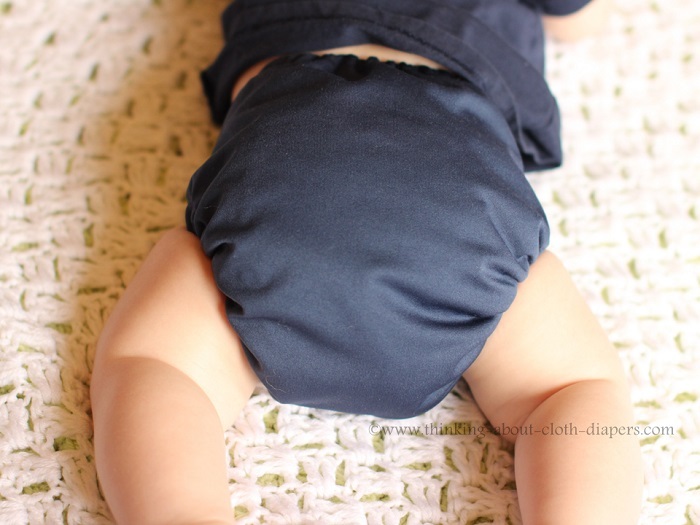 I didn't test the Ella Bella Bum insert, but have heard great things about it (here's a review of the diaper and insert). The benefit of this system is that if you already have lots of inserts (like I do) you don't get stuck with more than you need. Plus, you can customize your absorbency however you would like. Ella Bella Bum pockets are a bit narrower through the legs than some other pockets I have used, so some inserts may not fit as well as others. I tested out several inserts from my stash, and found that Funky Fluff, RagaBabe, and pad-folded flats were some of my favorites for this diaper. What do you love about this diaper? Athletic Wicking Jersey - While I'm sure a few other diaper makers use Athletic Wicking Jersey, it's still fairly uncommon, and has been a unique feature used by Ella Bella Bum on the inside layer. Because of it, their diapers are incredibly trim. I've always found that fleece is a bit bulky, and sometimes crumples up a bit on the inside of the diaper. 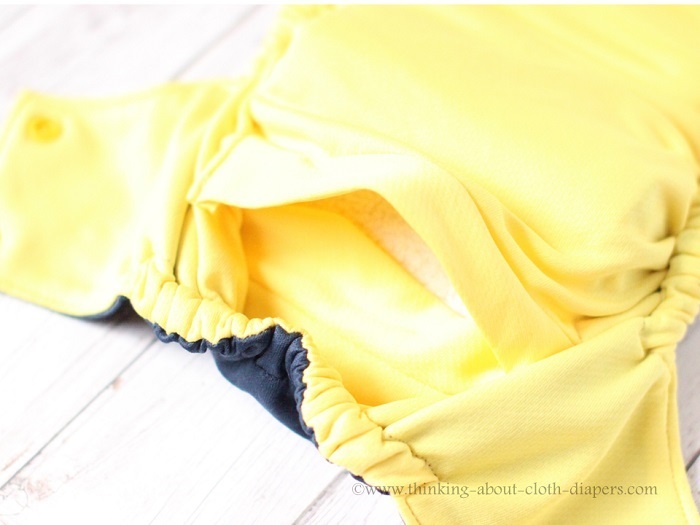 The athletic wicking jersey (AWJ) is somewhat stretchy, so despite the fact that Ella Bella Bum's diapers are a bit narrower through the crotch area than many other makes of pockets, they aren't hard to stuff... the stretchy AWJ makes stuffing the insert into the pocket much easier! This material also comes in a variety of colors, lending to the edgy style that is characteristic to the brand. Wide, Easy to Stuff Pocket Opening - Ella Bella Bum includes a pocket opening that is turned under and stitched on either side (you can see it in the photo above) making for a neat appearance. The pocket opening is down slightly from the back elastic, and once inserted, your insert can be tucked underneath the back "flap" (that's what I would call it anyway) so that none of the insert is exposed. This makes for a neat, leak-free diaper even when your baby spends time laying on their back, and is also a great feature if your baby is sensitive to moisture or if you choose to use microfiber inserts. Snug leg and back elastics (shown above) - we never had a single leak or explosion out of this diaper, and we've been using it for a couple of months now. 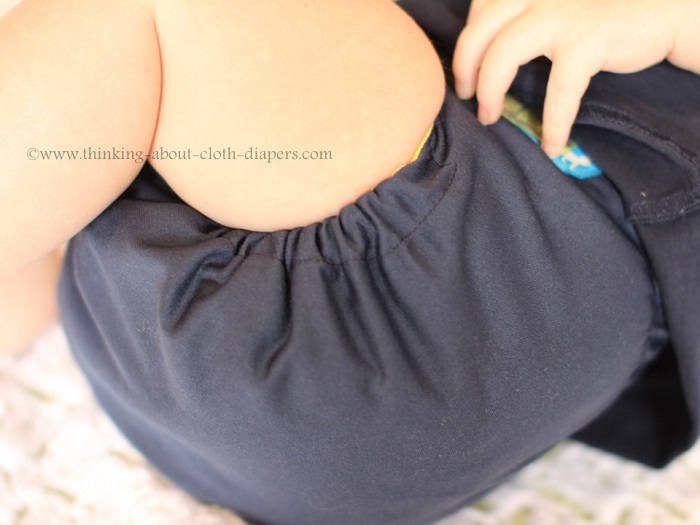 The elastics are stretchy but snug around the leg openings and the back, which helps contain everything in the diaper, even when it's snapped down on the smaller rise settings. Sometimes I find that inserts shift around inside pocket diapers and don't reach all the way out to the elastics, but I didn't find that with this diaper. The AWJ inner layer was a snug and stretchy fit that kept my inserts from shifting around, and so we didn't have any wicking of moisture out through the leg elastic seams, either. Overall smooth appearance - I've already said that this diaper is trim - it's also pretty smooth looking when it's on the bum. As you can see above, the tabs lay nice and flat, and even with the rise settings snapped down, there's not a lot of bulk, meaning that this diaper looks cute - without too much fluff! 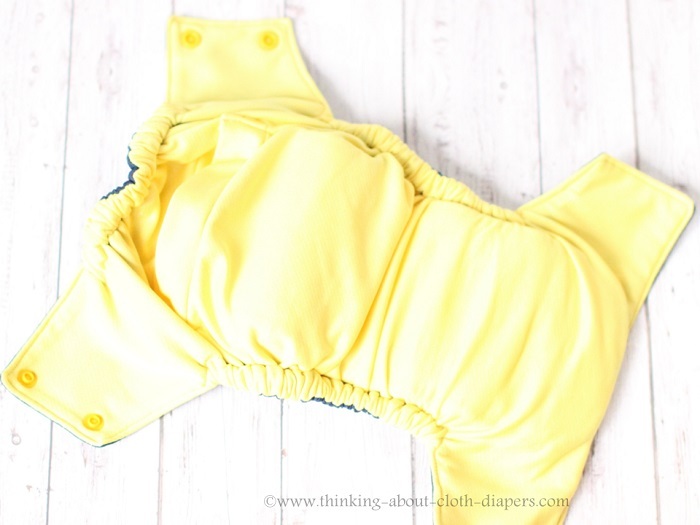 Easy to care for - After having tried a lot of different diaper brands, I think that there's also something to be said about diapers that continue to look good well after they are new. I'm usually leary of light colored inners, but with the AWJ inner, we haven't seen any staining (I actually took these pictures after 2+ months of use!) Both fleece and some of the cheaper PUL fabrics pill, but I haven't noticed any pilling on the AWJ inner or the PUL outer of this diaper. Trendy Colors - The designer behind Ella Bella Bum has style! The Ella'ssentials diapers come in some absolutely beautiful color combinations with vibrant PUL outers and uniquely contrasting AWJ inners and snaps. Visit their shop to see what I mean (I had a hard time choosing between Electric Tango and Lily Pad, and if I had a girl I would absolutely have both Fiona and Mermaid - both awesome without any pink!) The styles and color options in their premium diapers are even more striking! 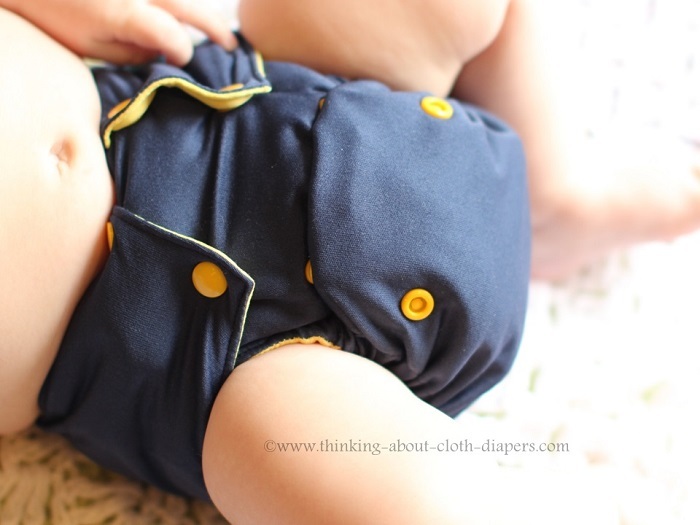 They offer wrap around embellished diapers (which feature a print at the top, and coodinating PUL and AWJ), custom embroidered alpha initials, ruffle bums, and more. Hand-Made in Canada - Another thing I love about Ella Bella Bum is that it's made by work-at-home moms (WAHM) right here in my home country. Usually, when you start buying WAHM diapers, it gets a little tricky, because they have a very small number of diapers that they sell each week. As the brand's reputation grows, it gets harder and harder to add their diapers to your collection. Ella Bella Bum started out that way, too, but Sam has found a smart way to grow production on her diapers with the help of some talented seamstresses and some production assistants. I am really excited that Ella Bella Bum has ironed out the kinks in their production so that the average mom can get their hands on these diapers when they want to purchase. How do you think this diaper fits relative to other diapers? Ella Bella Bum claims that their one-size pocket diapers will fit from 15-35 lbs+. I didn't try this diaper on my son until he was about 15 lbs, and it fit nicely then on the smallest waist setting and the 2nd rise setting. While I didn't test Ella Bella Bum's inserts (I opted to use some from my own stash), this diaper is trimmer than most - partly because it is narrower through the crotch than some other pockets (ex: bumGenius), and partly because of the light-weight athletic wicking jersey inner stay-dry layer. What would you change about this diaper? I've thought long and hard about what I would change about Ella Bella Bum's diapers, and honestly, I just can't think of a thing! 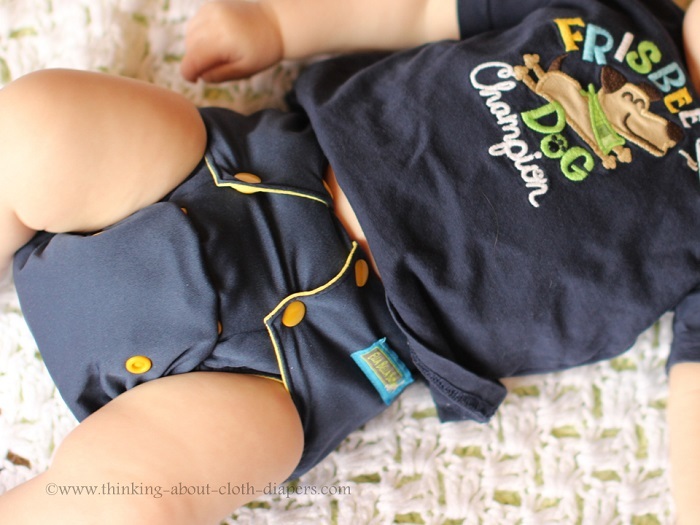 This is my absolute favorite pocket diaper - and I've tried a lot of pockets! 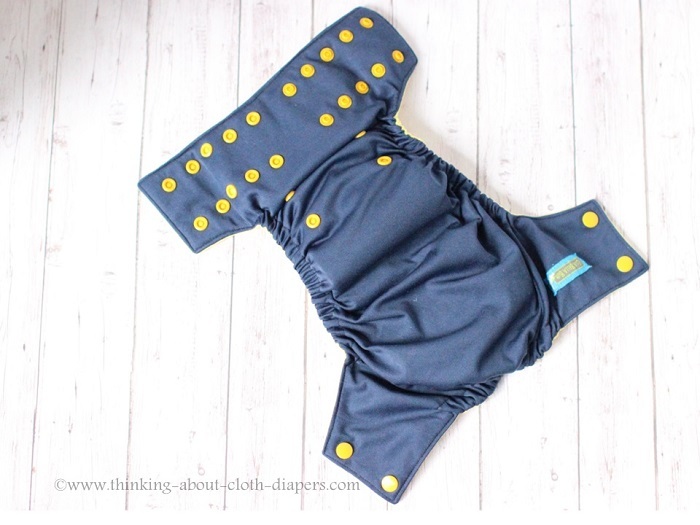 The one thing I would love to see for Ella Bella Bum in the future is availability through cloth diaper retailers. I don't know if Sam and her team have their sights set on mainstream distribution in the future, but I would definitely consider moving this diaper into distribution in retail outlets if I was running the show! This is a wonderful brand, but many people who purchase their diapers online through a traditional retailer don't even know that they exist! And that's a shame! Yes, on a scale of 1 to 4 (with 1 being never, and 4 being absolutely! ), I give Ella Bella Bum a 4. I generally stick with all-in-ones and all-in-twos, but this trim pocket is definitely finding a permanent home in my stash! I'm going to save up my diaper funds to snag an embellished wrap pocket at an upcoming stocking, too! I love the design and fit of this pocket diaper. I also love that they hold their value well (especially if you purchase one of their limited edition prints, embroidered diapers, or embellished wraps). Ella Bella Bum truly does live up to their slogan "eco trendy products for eco friendly families". Ella Bella Bum sells diapers directly from their online store. If you are a new customer, you will receive 15% off your order when you click on my referral link. 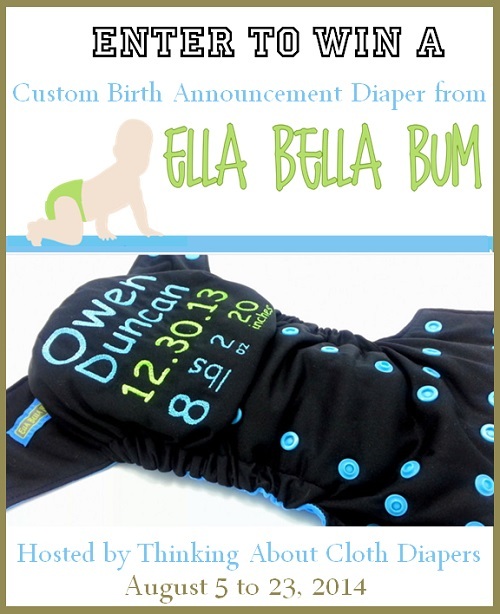 Ella Bella Bum has graciously offered up a birth announcement diaper as a giveaway prize. One lucky reader of Thinking About Cloth Diapers will have the chance to work with Ella Bella Bum to customize the diaper for their little one! Thinking About Cloth Diapers is not responsible for prize fulfillment. The winner will be contacted by email and must reply within 48 hours or another winner will be chosen. Disclosure: I was not compensated for this review, and purchased my Ella Bella Bum at retail price. The opinions expressed in this post are entirely my own, and your experience with the product may differ from mine. I only recommend products or services I use personally and believe will be good for my readers. This post may contain affiliate links. I am disclosing this in accordance with the Federal Trade Commission’s 16 CFR, Part 255: “Guides Concerning the Use of Endorsements and Testimonials in Advertising.” For more information, see our Disclaimer and Copyright. Go back to Our Favorite Cloth Diapers.